2017 was an exciting year for Markus Schulz aka the “Unicorn Slayer.” In 2017 he showed f his Dakota alias with the release a second album titled The Nine Skies, which was just released in December. Dakota is a much darker and emotional sound, something one would hear as we go down the rabbit hole with him on his all day or night events. In typical fashion, Schulz had is Global DJ Broadcast (GDJB) big event podcasts including the Sunrise Festival, city series, and Transmission, to include some the well known tunes he jams out to weekly. He closed 2017 with a magnum 10 hour open-to-close set at Avalon Nightclub in Hollywood, but he surprised fans with much more than his music during the event. 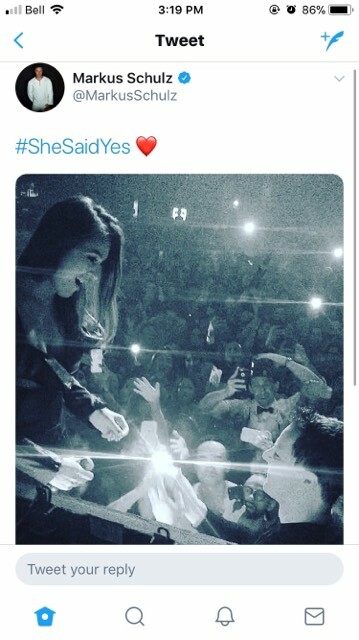 While playing his epic emotional track “Destiny,” Schulz invited his longtime girlfriend Adina Butar on stage and proposed to Butar. What a way and what a setting to pop the question. Fans can surely be excited for the news this engagement, and we all say Happy New Year and good luck and wish the newly engaged couple luck!